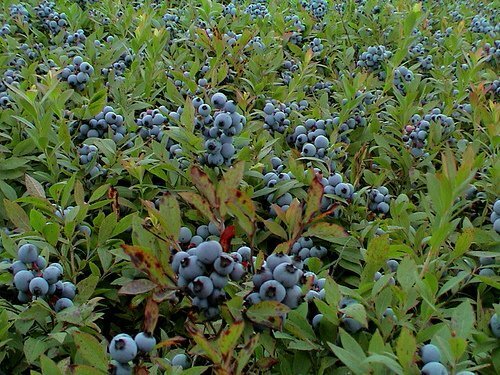 You can't really find vast�fields of wild�Lowbush Blueberry south of Maine. They especially seem to grow where there has been forest fire or clear-cutting. Always keep an eye out for bears in a lowbush blueberry field. We have them. But not so concentrated as in this picture. This was in Northern Maine outside of Acadia Park. We were driving and saw the blue hues. Most people think these are flower fields until they stop and go LOOK. They make much of the Blueberry Ale with these wilds up there. I love it...and counted over a hundred fields on this highway, alone. I've seen many farms too, blueberry farms. But these were just fields...not privately owned...it's awesome. Loved your pix. Brought back fond memories of camping there in youth. I think the birds and bears get most of our berries, but there are still plenty for us. The Wymans have been doing blueberries in Maine and Nova Scotia for generations. Not me, though. Helluva way to make a living. Yes, sort of like the Yankee version of pickin cotton. Picking blueberries, like much repetitive manual labor can be a meditativ experience, but usually only when done occasionally or for love. Once the commercial element intrudes, basta! Spoiled. Like cooking, gardening, or love, it has to be given for free or it can be oppressive. A bit like rowing crew. I always enjoyed messing about in boats, but when I tried to get kids to row crew they snarled "Slave sport!" because of the kids they know who only do it in hopes of better college offers. Presumably they would not object to punting on the Cam w a sweetheart! As a young man I made pretty good scratch raking blueberries. We camped out in the fields to maximize our haul. Good times.